William Lamont Ross - Dynamic. Inspirational. Gifted. These are just some of the words that have been used to describe Brother Lamont Ross. He is a minister, husband, and father who has dedicated his life to empowering others to transform their lives. His creativity, wisdom, and insight have inspired community, church and corporate audiences throughout the United States. Minister Ross’ engaging style has touched people of all ages, ethnic backgrounds, and walks of life. Brother Lamont Ross is the Senior Minister of the Marsalis Avenue Church of Christ in Dallas, Texas. Prior to that, he served as the congregation’s Family and Youth Minister and was the Youth Minister at the Eastside Church of Christ in Austin, Texas for six years. He holds a Master of Arts in Theological Studies from the Austin Graduate School of Theology. He has also earned a Master of Arts in Professional Counseling and graduated with honors from the University of Texas at Austin with a Bachelor of Science in Communication Studies. He is currently pursuing a degree in professional counseling. While at the University of Texas, he was recognized for his leadership and scholarship. Minister Ross has served on the NAACP National Board of Directors and was the founding president of the NAACP College Chapter at University of Texas. 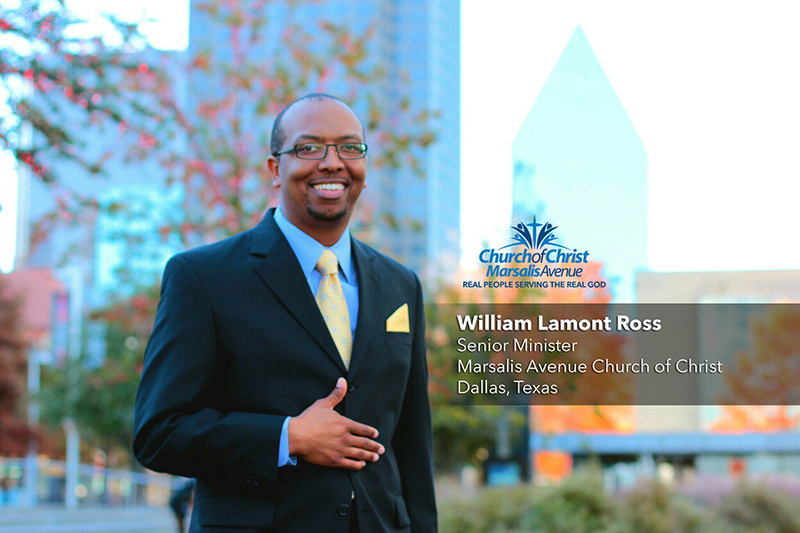 A native of Dallas, Texas, Minister Ross is a graduate of Skyline High School. While in graduate school, Minister Ross assisted small-business owners and emerging entrepreneurs in accessing capital and contracting opportunities, and in exploring sustainable business models. After completing his studies, he had a successful career at the transit authority in Austin, Texas in the area of business and community development. His experience in the business world and his grassroots involvement provide him with the perspective and sensitivity useful in bridging the gap between the front office and the front line and has been a blessing to his ministry. Minister Lamont Ross has been preaching for nearly twenty years and has been a featured speaker at lectureships, marriage seminars, singles workshops, and youth conferences. He is a Seminar Director who trains church leaders, counselors and marriage educators how to minister to couples using the Prepare/Enrich program served. He served two terms as president of the Dallas Citywide Youth for Christ, where he lead the organization in obtaining its 501(c)3 designation as a non-profit organization . He is the former co-host of a weekly radio show for young adults. Additionally, he is a featured commentator in the documentary Shattering Stereotypes of African American Teenage Girls. He has received a host of awards and honors for his work with youth and in the community. He and his beautiful wife, Stacy, have three wonderful children. This form allows you to request a speaker. Upon receipt, your information will be recorded, reviewed, and a Public Relations staff member will contact you regarding the status of your request. In 2008, the congregation hired Lamont Ross as its full-time Family and Youth Minister. On January 1, 2015, Minister Ross will become the Senior Minister of the historic church located on Marsalis Avenue and Grover C. Washington Avenue. “We brought Minister Ross back to Marsalis anticipating that he would become the Senior Minister at some point. We knew if we were going to reach a new generation for Christ, we needed someone whose primary role would be to connect to Generation Y,” said Jewel Manzay, one of the six elders of the church. After serving in Austin, Texas, Minister Ross, returned to Dallas where he has many family and friends. A native Dallasite, Minister Ross spent his formative years at the Marsalis Avenue congregation.“I am amazed by the providence of God. Only God knew that nearly 25 years later I would return to minister to the people that my wife and I know and love,” he says. Minister Ross holds a Master of Arts in Theological Studies from the Austin Graduate School of Theology and graduated with honors from the University of Texas at Austin. He and his wife, Stacy, who also grew up at the church under the leadership of the late Grover C. Washington, have three children. The official installation service was January 18, 2015 for Minister Lamont Ross.